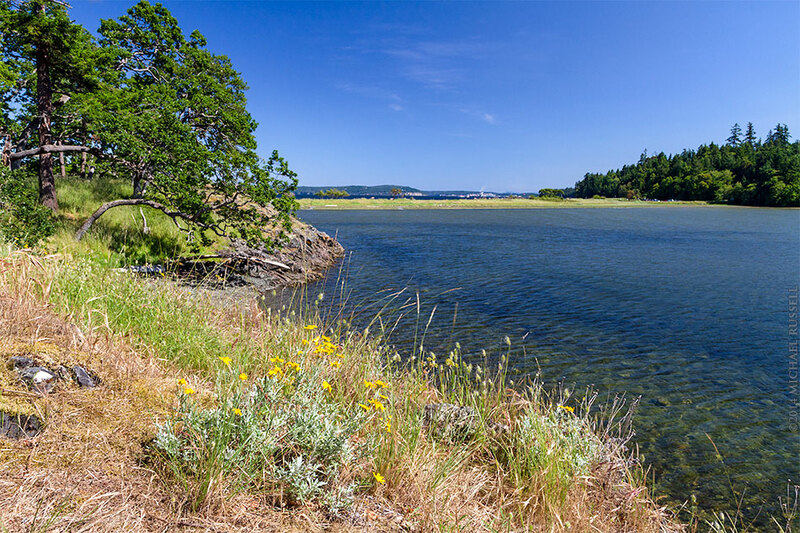 A grove of Garry Oaks (Quercus garryana) and Woolly sunflower (Eriophyllum lanatum) growing along the shore of Pipers Lagoon Park in Nanaimo, British Columbia, Canada. Pipers Lagoon Park is a great park to visit if you are near Nanaimo, British Collumbia. While not very large, this park packs a lot of interesting plants, trees, and wildlife into a small area. When I was there in June of 2013 I saw a wide variety of marine birds, large numbers of shore crabs, wildflowers, and even some Garry Oak groves. You can see some Garry Oaks on the left hand side of the photograph above, and some Woolly sunflower plants growing in the foreground. Not an easy location to photograph wildflowers though, being right on the water there is always a bit of wind. You can view more photographs from Vancouver Island in my Vancouver Island Gallery.